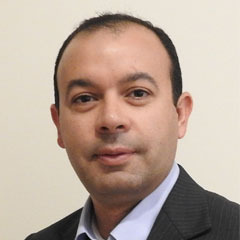 Sherif M. Hanafy is currently a visiting associate professor at KFUPM, he was a senior research scientist at KAUST from 2009 until July 2018, during this time he was the founder and in charge of the geophysical field program (Seismology Lab). His research interest includes geophysical field methods, seismic interferometry, traveltime tomography, early arrival tomography, seismic modeling, seismic inversion and migration, data interpolation/extrapolation, and shallow application of resistivity and GPR methods. In the last year, he got more involved in the machine learning especially in processing and interpretation of seismic and GPR data. Ph.D. in Geophysics (Kiel University, Germany – Cairo University, Egypt), 2002. M.S. in Geophysics – Seismic (Cairo University, Egypt), 1996. B.S. In Geophysics (Cairo University, Egypt), 1993. Yu, H., S. M. Hanafy, J. Huang, Y. Chen, 2018. Visco-acoustic Wave-equation Traveltime Inversion and Its Sensitivity to Attenuation Errors. Journal of Applied Geophysics. https://doi.org/10.1016/j.jappgeo.2018.02.019. Hanafy, S. M. and G. Schuster, 2017. Parsimonious refraction interferometry and tomography. GJI, 209, 695–712, doi: https://doi.org/10.1093/gji/ggx042. Hanafy, S. M., A. Mattson, R. L. Bruhn, S. Liu, and G. Schuster, 2015. Outcrops and well logs as a practicum for calibrating the accuracy of traveltime tomograms. Interpretation, 3, SY27-SY40. Al-Hagan, O., S. M. Hanafy, and G. Schuster, 2014. Iterative supervirtual refraction interferometry. Geophysics, 79, Q21-Q30, doi: 10.1190/GEO2013-0210.1. Yu, H. and S. M. Hanafy, 2014. An application of multiscale early arrival waveform inversion to shallow seismic data. Near Surface Geophysics, 12, 549 – 557, doi: 10.3997/1873-0604.2014002. Hanafy, S. M and G. Schuster, 2014. Interferometric interpolation of sparse marine data. Geophysical Prospecting, 62, 1-16, doi: 10.1111/1365-2478.12066. Hanafy, S. M. and O. Al-Hagan, 2012. Super-virtual refraction interferometry: an engineering field data example. Near Surface Geophysics, 10, 443-449. Schuster, G., S. M. Hanafy, and Y. Haung, 2012. Theory and feasibility tests for a seismic scanning tunneling macroscope. Geophysical Journal International, doi: 10.1111/j.1365-246X.2012.05564.x. Hanafy, S. M., W. Cao, M. McCarter, and G. Schuster, 2009. Using super-stacking and super-resolution properties of time reversal mirrors to locate trapped miners. The Leading Edge, 28, 302-307. 2017: The SEG Honorary Lecturer in the Middle East and Africa. 2015 – Present: Associate editor at the SEG (Geophysics). 2013 – Present: Member of the “Continuing Education Committee” at the SEG. 2013 – 2015: Special editor at the SEG. 2013 & 2015: Member of the organizing committee of the 1st (2013) and 2nd (2015) SEG/DGS workshop at Bahrain “Near Surface Modeling and Imaging”. 2012 – 2016: Key contact of the “Seismic Theory” sessions at the SEG annual meetings. 2010: Co-founder of the CSIM, KAUST. 2005: Founder and Advisor (until 2007) of the SEG Cairo University Student Chapter. 2004 – 2005: Fulbright scholarship. 2004: Best paper at the 2004 EGS meeting (Abdelhady, Morsy, and Hanafy). 2004: Best presentation at the 2004 EGS meeting (Abdelhady, Hanafy, and Morsy). 1999 – 2002: Ph.D. scholarship, DAAD, Germany.